Are you looking to be a figure of Christianity? 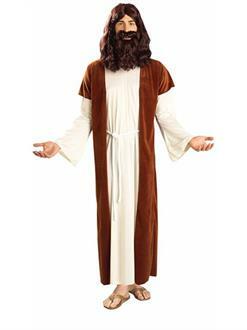 Then look no further, the Jesus Costume for Men comes with a white full length long-sleeved tunic and a brown short sleeved robe with a white front closure tie. This costume comes in one standard size that will fit everyone. Try accessorizing this costume with a pair of Brown Roman Sandals for Adults and a Brown Shepherd's 68 in Crook Accessory. And top if off with a biblical brown wig for adults and a white shepherd's crook is an alternative choice. This costume is open to everything!